ESR (early stage researcher) shall at the time of recruitment by the host organization be in the first four years of their research careers. Applicants may be on a PhD program but cannot be PhD holders at the day of signing their employment contract. The project provides full funding for tuitions fees and salary. Living allowance (multiplied by the country correction factor which varies between 0.98 and 1.2): 3110 euros per month. Mobility allowance: 600 euros per month. Family allowance (if applicable): 500 euros per month. Ice accretion causes malfunction and breakdown of wind power turbines, antennas and power lines. De-icing causes high environmental costs due to the consumed energy and chemicals. Still, icing and de-icing of surfaces is poorly understood. We lack microscopic information of the underlying processes close to the surface. We expect that space and time resolved information combined with the information on the stickiness of ice to the surface will foster our understanding of icing and deicing of surfaces, on cracks formation and propagation and on rupturing of surfaces. The aim of this project is to study the efficiency of soft and hard micro-structured surface for anti-icing applications. The successful candidate will investigate where ice nucleates and how it grows? Does a structure fail during icing or de-icing? Where and how do cracks form and propagate? To gain the required space and time-resolved information, currently, we are setting up a homebuilt laser scanning confocal microscopy that is accompanied with an icing chamber. The candidate is expected to further develop the setup in team work, including the construction of an improved icing chamber that permits to work at temperatures down to -20 °C. Furthermore, the candidate will be in charge of combining the setup with a homebuilt device to measure the adhesion force. Textured substrates which are infiltrated by a lubricant form a new class of functional surfaces, called slippery surfaces. The texture is key for capillary forces to retain the lubricant in place. Slippery surfaces can repel almost all types of liquids. However, moving liquid drops (for example water) are surrounded by an annular wetting ridge, which can cause transport of lubricant (for example an oil) with the moving liquids. The same “problem” shows up if a water film is flowing over the lubricating fluid. The aim of this project is to understanding the interplay among the physical- and chemical interactions between the solid surface topography, the lubricating film and the liquid under static and flow conditions. 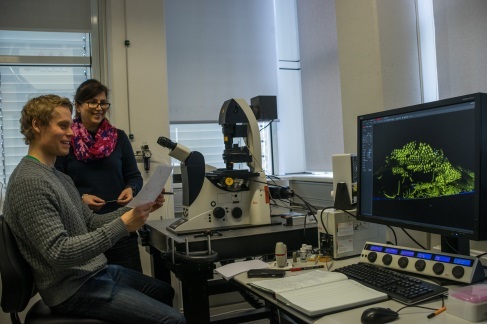 To gain insight into the underlying mechanisms, the candidate will apply laser scanning confocal microscopy. This allows visualizing the sliding liquid, the lubricant, and the textured substrate with a spatial resolution of a few hundred nanometers at a line frequency of 8 kHz. The flow field can be visualized by adding tracer particles. The candidate will investigate microstructured surfaces impregnated by Newtonian liquids or swollen gels. To minimize biofouling, understanding of the adhesion of proteins, bacteria and cells on lubricating surfaces is essential. Within the here announced PhD thesis, the motion of bacteria and cells will be monitored by laser scanning confocal microscopy in 3-dimensions. This information will be complemented by XPS, SEM and further surface sensitive techniques. In particular we aim to understand how adhesion depends on the type of lubricant and flow velocity. In close cooperation with chemists and material scientists, the candidate will design surfaces with different chemical affinity of the lubricant to the surface. Millions of tons of surfactant and aggressive chemicals are annually used to clean surfaces, bottles, storage-jars, or walls. Economic losses due to biofilm formation are estimated to be above 40 billion € per year in the shipping industry and account for 80% of microbial infections in the body. An important motivation behind developing slippery surfaces is for their anti-fouling properties: Deposited liquid or solid particles, bacteria or other microorganisms easily slide off as soon as the surface is tilted by a few degrees. Typical swimming trajectories in a thin film for two different organism types. The DPhil (= Oxford PhD) student will model the dynamics of particles and bacteria on the slippery surfaces and investigate the most efficient way to minimize friction and optimize contaminant removal. We shall ask what determines the adhesion of particles and microorganisms to gel- or lubricant impregnated surfaces? Does adhesion depend on the concentration of particulate matter, the viscosity of the lubricating film and its flow velocity? How do the swimming properties of the microorganisms affect adhesion? At Oxford we will concentrate on mesoscale modeling (lattice Boltzmann and stochastic rotation dynamics) and analytic approaches, with close interactions with molecular modelers and experimentalists in the LubISS network. An interest in computational and theoretical physics. Strong analytic ability, as evidenced by eg an excellent first degree in physics, mathematics or a related subject. A willingness to contribute fully to the scientific interactions of the network. A close interaction between modeling and experiment will be very important to fully understand and exploit the interaction of fluids with structured surfaces. LubISS aims to integrate modeling across all length scales to investigate properties that range from the detailed behaviour at the contact line to the way in which fluid films move across the designed substrates. The DPhil (= Oxford PhD) student employed on this project will play a pivotal role by developing multiphase lattice Boltzmann simulations to model flow over the structured surfaces. We will need to determine how to include several coexisting phases, and how to model the viscoelastic properties of the lubricants. The codes will be used to consider the ability to repair surfaces by wicking, assess the dependence of lubricant stability on substrate geometry, and consider splashing and the consequent lubricant removal caused by droplet impact. The direction of the project will also depend on close interactions with other members of the LubISS team. An interest in computational physics. There are number of applications where high repellency of surfaces would be beneficial such as ice accretion and easy cleaning. Lubricant impregnated surfaces provide potential solution to create such properties. The aim of this PhD work is to study continuous/roll-to-roll fabrication of LUBricant Impregnated Slippery Surface multilayer structures or parts of them. The successful candidate will define the requirements for the fabrication of the developed LUBricant Impregnated Slippery Surface -structures using continuous and/or roll-to-roll system. The candidate will focus on characterizing and testing of the performance of developed layers and structures and their functionalities. The candidate will research the performance of the lubricant impregnated surface-structures and the parameters influencing fabrication under pilot-scale conditions. Important part of the work is the assessment of performance determined by application such as packaging. Surface engineering shows an increasing potential to provide a sustainable approach to icing problems. Currently, several passive anti-ice properties adoptable to coatings are known, but further research is required to proceed for practical applications. This is due to the fact that icing reduces safety, operational tempo, productivity and reliability of logistics, industry and infrastructure. This research work focuses on the development of icephobic coatings by using thermal spray technologies. Slippery structures produced by using thermal spray processing will be studied and optimized in order to develop functional slippery surfaces with a low ice adhesion. Functionalization of thermal spray coatings will be considered as potential method in order to produce icephobic surfaces, being the key research area in this PhD work. The aim of this project is to study functionalization of thermal spray coatings by tailoring coating materials and coating structures for anti-icing applications. The successful candidate will develop slippery coatings and investigate the icing properties of potential thermal spray coatings. 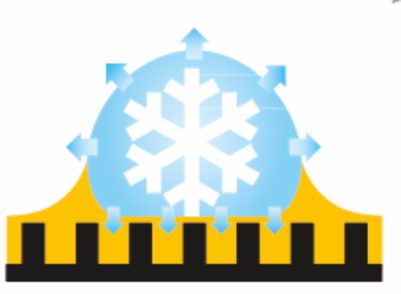 What is an optimal coating and surface structure for the low ice adhesion? What is the durability and functionality of these surfaces in cyclic icing conditions? How icing conditions affect the icephobicity? The candidate will focus on the development and preparation of feedstock materials, production of coatings and investigations of coating properties such as the ice adhesion and related surface properties. Ice formation and ice adhesion will be analyzed at TUT with the new design icing wind tunnel and centrifugal ice adhesion test facilities. The icing wind tunnel is capable of simulating ice accretion by both in-cloud mechanism (glaze and rime icing) and precipitation icing. Using these icing facilities, icing behavior in different icing conditions will be studied. To measure and understand the friction force generated as drops run along slippery surfaces. To explore the way line friction impacts the region of contact line (formation of rims, etc.). The aim of this project is to characterize the dewetting conditions and dynamics on slippery surfaces. The successful candidate will characterize the formation and fate of liquid films deposited on liquid-infused surfaces. The project is mainly experimental, even if a light modelling will complete it. In a first step, we will discuss the conditions and characteristics of films deposited by withdrawing an infused material out of a bath. In a second step, we will look at the dewetting of such films, as it can happen after nucleating a dry zone inside the film. We seek an outstanding, highly motivated PhD student to experimentally study the impact of drops on lubricant impregnated slippery surfaces. Drop impact is naturally important in many applications, and provides an excellent tool to characterize the performance of the surfaces. The goal of the project is to study the impact using high-speed interferometric imaging to visualize the deformation of the lubrication layer, measure the drop spreading and rebounding. The methodologies involved are a combination of high-speed imaging techniques based on interferometry. The candidate is expected to be familiar with experimental work in fluid mechanics or soft matter. Experimental skills and data analysis. We seek an outstanding, highly motivated PhD student to investigate numerically and theoretically the dynamics of droplets on lubricants, gels and lubricant impregnated slippery surface. The motion of droplets on such complex surfaces is governed by the dynamics of the “wetting ridge” near the contact line. Developing detailed methods for wetting ridge dynamics is key for understanding the performance of lubricant impregnated surfaces. The aim of this project is to study numerically and theoretically the dynamics of droplets on various soft and liquid surfaces. The methodologies involved are a combination of lubrication theory for thin film flows (to address the macroscopic dynamics) and the Molecular Dynamics simulations (to reveal the fluid-fluid or fluid-solid mechanics at molecular scale). The candidate is expected to be familiar with one of the methods, with an affinity for theoretical analysis. Expected Results: This work package aims at doing a thorough characterization of the ice-phobic properties of the LubISS coatings developed according to aeronautic requirements set by AGI/Airbus according to a test matrix all partners must agree upon. An AGI-proprietary ice adhesion test will be applied. Characterisation of the overall material properties of the developed coatings with standard surface analysis tools on coupon tests. Characterisation of the designed functionalities of the coatings and performance assessment (i.e., reduced ice adhesion or delay of ice formation and growth) with lab-scaled and full-size icing wind tunnel tests and ice adhesion measurements on coupon tests and scaled aerodynamic profiles. Develop physical understanding of the main parameters influencing interactions between ice or contaminants and the lubricant impregnated surfaces under close-to-real operating conditions. Characterization of the aging/durability of the developed coatings with lab-scaled and full-size icing wind tunnel tests. Controlling the adhesion of bacteria via a combination of fibre treatment and surface functionalization. Antiadhesive surface coatings that prevent the attachment of proteins, bacteria, fungi and higher organisms are promising alternatives to the use of traditional biocides. In this context, surfaces decorated with polyethlylene glycol (PEG) or zwitterions (betaines), respectively, proved to be highly effective for this purpose. In both cases, the resulting strongly hydrated surfaces are able to reduce the adhesion of proteins, bacteria and fungi efficiently. Because PEG is degraded oxidatively in the presence of light, however, zwitterionic surfaces are more promising targets for applications in the textile sector. Accordingly, the generation of microstructured surfaces with zwitterionic surface groups on textiles and the investigation of their interplay will be the main focus of the current project. Evaluation and optimizing of wear resistant lubricant impregnated surfaces for demanding non-sticking contact surfaces using e.g. Taber and Eriksen testing. Non-sticking/easy-to-clean properties will be evaluated by contact angle measurements, by release force determinations and by brushing tests. 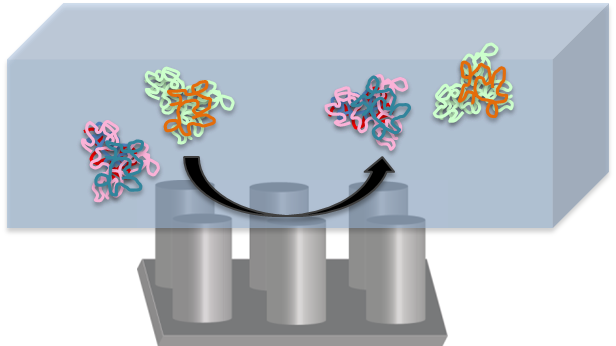 Developing silicone nanoparticle (SNP) dispersions useful as stable anti-adhesive lubricants. Investigation of the anti-wetting effect of SNPs on surfaces as ingredient of lubricants. Observation of biofouling at such impregnated surfaces; Adapt Supercritical Angle Fluorescence technologies (3D-SAF, SAF-FRET, SAF-FCS) to measure (bio-)particle adhesion.